Below are the official Hockomock League Boys Soccer All Stars, selected by the coaches in the league. 1st Quarter: (NA) Patrick Johnson 65 yard interception return, Connor Flynn XP; (NA) Nick Rajotte 30 yard rush, C. Flynn XP. 1st Quarter: (Sto) Guy Eddy 1 yard run, XP missed. 2nd Quarter: (Can) Jake Ragusa 2 yard run, Thomas Monagle XP. 4th Quarter: (Sto) Jake Gibb 18 yard pass to Eddy, 2-point failed; (Can) Dennis Ross 35 yard pass to Michael Harris, Woanyen Mahn 2-point run; Gibb 27 yard field goal. Overtime: Ragusa 2 yard run, Monagle XP; Gibb 2-yard run, 2-point failed. 1st Quarter: (F) Mark Clagg 52 yard pass to Austin Ryan, John Cronin XP good; (F) M. Clagg 15 yard pass to Ronnie Martin, J. Cronin XP good. 2nd Quarter: (M) Blake Hill 5 yard rush, XP good; (F) Darren Kelly 12 yard rush, J. Cronin XP good. 3rd Quarter: (F) Austin Ryan 99 yard punt return, J. Cronin XP good; (M) Zach Lanzetta 10 yard pass to Blake Hill, XP good; (F) R. Martin 11 yard rush, J. Cronin XP good. 4th Quarter: (F) D. Kelly 65 yard rush, J. Cronin XP good. 1st Quarter: (KP) Zach Boari 17 yard field goal. 2nd Quarter: (F) Nick Yelle 20 yard field goal. 3rd Quarter: (KP) John DeLuca 2 yard rush, Z. Boari XP good. 1st Quarter: (OA) Liston Funai 7 yard rush, 2pt fail. 2nd Quarter: (S) Tyler Smith 55 yard rush, Josh Rotman XP good; (S) Rob Bayha 21 yard pass to Craig Titus, J. Rotman XP good; (S) R. Bayha 21 yard pass to Bryce Smith, J. Rotman XP good. 3rd Quarter: (S) Juvan Elisma 43 yard rush, J. Rotman XP good. 4th Quarter: (OA) Charlie Ryan 12 yard pass to Shawn Cardoza, XP fail. Canton, 0 @ Franklin, 2 – Final – Kevin Hall scored for the third straight game, this time off an assist from David Stowell to pace the Panthers. Austin Kent added an unassisted for for Franklin. Oliver Ames, 1 @ Kinge Philip, 0 – Final – Oliver Ames senior Keegan Nutt headed home the lone goal of the game, finishing off a rebound off of Chris Romero’s shot that hit the crossbar. Milford, 1 @ Taunton, 3 – Final – Lens Esquil scored for the second consecutive game, this time finding the back of the net twice for the Tigers. 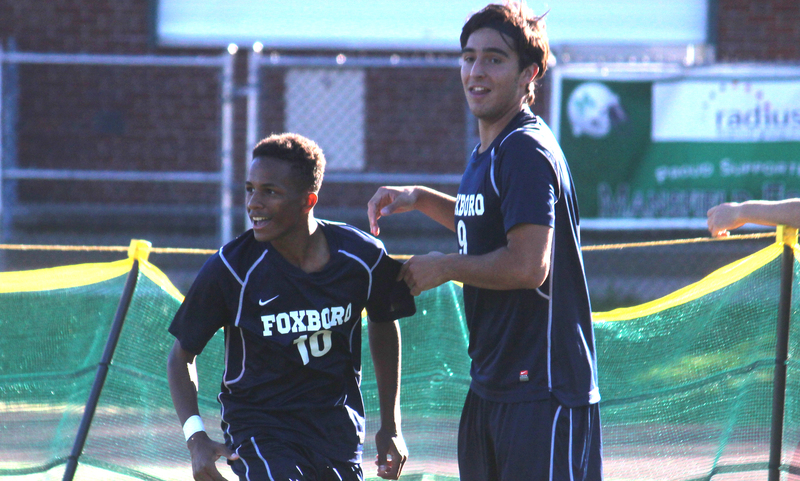 Senior Austin Botelho had two assists and Daeshawn Duffy scored once. Sharon, 4 @ North Attleboro, 1 – Final – Sharon found the back of the net just five minutes into the game when Lucas Allaria converted an assist from Jake Goloboy. James Dunlea doubled the league off an assist from Liam McManus and Stephen Higgins scored unassisted in the 34th minute to make it 3-0. Matt Lowerre capped Sharon’s scoring shortly into the second half off an assist from Dunlea. Gareth King netted a late goal for the Rocketeers. Franklin, 2 @ Canton, 0 – Final – Megan Georges and Meghan Dieterle scored the goals for Franklin both assisted by Victoria Stowell. Mansfield, 4 @ Foxboro, 2 – Final – Jen Kemp scored two goals and assisted on a pair of Jackie Carchedi goals in the first half for the Hornets. Hannah Burns scored in the first half and Lily Sykes scored with five minutes left for Foxboro. King Philip, 0 @ Oliver Ames, 4 – Final – Francesca Calabraro scored a pair of goals for OA. Emily Freeman and Julia Roy also scored, while Delaney Benton had three assists for the Tigers, who scored all their goals in the first half. Taunton, 1 @ Milford, 2 – Final – Kristen Franzini scored off an assist by Gabbie O’Neil and Katie Brown headed home the winner with fewer than two minutes remaining assisted by Francesca Shipperd. Christine Pye returned from injury to make 11 saves in goal. Abby Small had the goal for Taunton. North Attleboro, 5 @ Sharon, 0 – Final – Hana Caster scored once and had two assists, Shannon Kingsley netted a pair of goals and Haley Guertin picked up two points for the Rocketeers, who led 3-0 at half. Felocity Monfils also added a goal for the Rocketeers and Leah Jette had an assist. Kiersten Bixby and Nina Beauvias combined for the shutout in net. King Philip, 1 @ Bishop Feehan, 3 – Final – King Philip fell on the road, 20-25, 25-21, 21-25, 16-15. Mansfield, 1 vs. Needham, 3 – Final – Mansfield picked up a win in the second set to level the match but Needham took sets three and four to get the win, 19-25, 25-17, 22-25, 16-25. Cathryn Heavey had 33 assists and 10 digs in the loss for the Hornets. Stoughton, 1 vs. Cardinal Spellman, 3 – Final – Stoughton suffered a 26-24, 15-25, 24-26, 19-25 loss on the road. Bianca DeSousa had 16 assists, 14 digs, 10 service points, eight aces, five kills and two blocks and Val Whalen added seven kills and seven blocks. King Philip, 169 @ Oliver Ames, 157 – Final – Jack Green’s 37 paced Oliver Ames while Brian Lambert carded a 39. Todd Bushway and Danny McLoughlin each shot 41 for King Philip. Stoughton, 190 @ Franklin, 165 – Final – Matt Dao and Matt Pleshaw each shot a 40 for the Panthers. Taunton, 208 @ Mansfield, 206 – Final (5 cards) – David Craig led Mansfield with a 39, who picked up its second straight win on a card off. Devon Barbero shot a 40, Mike Marry shot 41 and Matt Chirichiello carded a 42. 1st Quarter: (C) Woanyen Mahn 4 yard rush, Thomas Monagle XP good. 3rd Quarter: (F) Mark Clagg 43 yard pass to Ronnie Martin, John Cronin XP good; J. Cronin 29 yard field goal. 1st Quarter: (A) Brendan Nunes 14 yard rush, Lewis XP good; (A) John Burns 35 yard rush, Lewis XP good. 2nd Quarter: (A) B. Nunes 51 yard rush, McKenna XP good; (A) J. Burns 4 yard rush, McKenna XP good. 3rd Quarter: (A) Ethan Dubeau 15 yard rush, McKenna XP good. 4th Quarter: (A) Sam Corrado 2 yard rush, XP failed; (T) Jason DaRosa 1 yard rush, 2pt failed. 2nd Quarter: (M) Brian Lynch 40-yard pass to Nick Graham, D. DeSousa XP good; (KP) Giovanni Fernandez 1-yard rush, Z. Boari XP good. 4th Quarter: (KP) Alex Olsen 1-yard rush, John DeLuca 2-point rush. 1st Quarter: (M) Zach Lanzetta 19 yard pass to Blake Hill, Sean Lehane XP good. 2nd Quarter: (M) Z. Lanzetta 30 yard pass to B. Hill, S. Lehane XP good; (M) Z. Lanzetta 14 yard pass to Leo Moronta, S. Lehane XP good; (M) Z. Lanzetta 23 yard pass to Jack DeSantis, S. Lehane XP good. 4th Quarter: (M) B. Hill 1 yard rush, S. Lehane XP good; (M) Shapel Feaster 45 yard rush, S. Lehane XP good; (OA) Aidan Connly 4 yard rush, Kyle Gagliardi 2pt rush. 1st Quarter: (Sto) Christian Hill 4 yard rush, XP failed. 2nd Quarter: (Sto) Ryan Sullivan 7 yard rush, 2pt failed; (Sto) C. Hill 5 yard rush, R. Sullivan 2pt rush. 3rd Quarter: (Sto) Jordan Taylor 1 yard rush, Guy Eddy 2pt rush. 4th Quarter: (Sha) Juvan Elisma 1 yard rush, 2pt failed; (Sto) Nick Hardy 10 yard rush, XP fail; (Sha) J. Elisma 25 yard rush, 2pt good. North Attleboro, 0 @ Attleboro, 3 – Final – Zach Rodrigues scored once in the first half and then again in the second half to pace the Bombardiers over rival North. Junior Coca also scored a first half goal for Attleboro. Franklin, 2 @ King Philip, 0 – Final – Hatim Brahimi put the visitors in front off an assist from Brian Czuba and Franklin took a 1-0 lead into the break. Senior Nick Parent then iced the game with a late goal in the second half off an assist from senior Austin Kent. Taunton, 1 @ Mansfield, 4 – Final – Five minutes into the game, sophomore Sean Lanzillo put the hosts on the board off an assist from Jack Rielly. Just over 15 minutes later, senior Jared Miller doubled the lead for the Hornets off an assist from Charlie Rogers to take a 2-0 lead into the break. Five minutes into the second half, Lanzillo set up Rogers for Mansfield’s third goal and just 10 mintues later Brendan Sullivan finished off a pass from Jareme DiLoranzo to make it 4-0. Austin Botelho scored a late goal for Taunton. North Attleboro, 5 @ Attleboro, 1 – Final – Sophomore Haley Guertin and senior Hana Caster linked up three times for the Rocketeers to get a big win on the road over rival Attleboro. Caster set up Guertin for North Attleboro’s first and third goals while Guertin set up Caster for the Rocketeers’ fourth goal. Leah Jette scored North Attleboro’s second goal off an assist from Felicity Monfils and Caster added her second on a breakaway. Paige Medeiors scored Attleboro’s goal. King Philip, 0 @ Franklin, 2 – Final – Bailey Knous and Alexis Stowell each scored goals for the Panthers. Taunton, 0 @ Mansfield, 2 – Final – Jackie Carchedi had a goal and an assist for the Hornets. Jen Kemp had the second goal and Emily Gaumond made four saves to record her fifth shutout of the season. Stoughton, 0 @ Milford, 2 – Final – Katie Brown and Kristen Franzini each scored for Milford and Maggie Boyle had her fourth assist of the season. Stoughton goalie Marissa Williams made 12 saves in her first game back from injury. Stoughton head coach Tara Daniels said Samantha Tullis, Sarah Quattrucci, and Sarah Widrow kept Stoughton’s back field strong. Oliver Ames, 3 @ Foxboro, 2 – Final – Oliver Ames picked up its third straight win with a 25-20, 20-25, 22-25, 25-17, 15-9 win on the road. Bridget McCarthy led Oliver Ames with 48 assists and Emma Petrillo controlled the offense with 22 kills. Franklin, 3 @ King Philip, 1 – Final – The Panthers picked up a key Kelley-Rex win with scores of 28-26, 26-24, 19-25, 25-21. Dayna McCue had 30 digs and four aces, Aubrie Kutil and Beth Neal each had 10 kills while Kutil added an ace and Neal had a pair of aces and blocks and 13 assists. Franklin Head coach Kate Horsmann said Caroline Maguire had a huge role defensively at the net with four blocks and three kills. For King Philip, Josie Rowean led the team in attacks and had six service points in game one, Gwen Uyrus added seven service points in game two, Emma Lopez had eight service points in game three, and Amanda Loewen had five digs. Taunton, 3 @ Mansfield, 2 – Final – In a back and forth affair, Taunton snapped its three game skid with a 11-25, 29-27, 25-20, 16-25, 15-12 win. Tatum Speicher wa the catalyst for the offense with 39 assists, six digs and three kills. Molly Sullivan had 29 serve receives and 16 digs while Meghan Navarro solidified the back row with 15 digs and three aces. Mansfield sophomore Meg Hill had 13 hills, Juliana Newell added eight kills and Jess Haradon had 17 digs. Milford, 2 @ Stoughton, 3 – Final – Stoughton rallied from a 2-1 deficit to pull off a 13-25, 25-18, 23-25, 25-23, 15-13 win in thrilling fashion. Stoughton senior Bianca DeSousa had 20 assists, 15 digs, 27 service points and 10 aces and sophomore Valerie Whalen had 15 blocks and 6 kills. Stoughton head coach Ken Gay said Elizabeth Slade had outstanding defensive play for the Black Knights. For Milford, Jill Powers had a team-best 12 kills while Kara Halpin, Aleye Momodu and Kayla Antonellis each had seven kills apiece. Lauren Zouranjian and Allie Collins combined for 41 assists. Canton, 171 @ Franklin, 180 – Final – Canton sophomore Jack Goyetch was the match medalist, shooting a 40 for the day. Bryan Woelfel shot a 43 for the Panthers. The Bombardiers had a great 2014 regular season and then had an even better run in the playoffs, pulling off an upset of second-seeded New Bedford. This year, the Bombardiers will be looking to get back to the postseason but there will be a challenge after graduating a group of talented, experienced players in the Class of 2015. The good news is that coach Peter Pereira has a good group of players this season. Zach Rodrigues, a player that has a ton of varsity experience, is a good starting spot for a team that will likely be right in the thick of the wide-open Kelley-Rex title race. Junior Harry Lancaster is also back for his third year on varsity while Junior Coca will be another talented player in the middle of the field for Attleboro. Ahijah Joseph emerged as a credible player during his sophomore year and is back for what could be a breakout junior season. For the past four seasons, the Panthers have claimed the Kelley-Rex division title. This year, it could be more of an uphill battle in order to claim a fifth straight. The Panthers graduated 16 seniors and a good solid chunk of their starting lineup so a couple of strong returning players will be relied on heavily for coach Fran Bositis. Austin Kent is the only starter back and 2015 will be his third year on varsity. Hatim Brahimi had a big sophomore season last year and his junior campaign could be a big one for him. Senior Nick Parent will see his role increase this year while Danny Geraci and Pat Kapples are two players who have some experience in the back. Henri Guilmette will step in as the new goalie and could have a breakout 2015. The Warriors were a tough team to beat last year and that should continue to be the case in 2015. Nick Gale steps in as the new head coach for the program as the Warriors will be a serious content to claim their first division title since 2010. UMass Lowell-commit Joe Kellett has been one of the top players in the league for the past two years and with 2015 being his senior season, it would be the best one yet. The 2013 Underclassman of the Year has had to overcome some injuries but every year continues to have a serious impact on games. Kellett will be complemented by senior Clay Geuss in the midfield while sophomores Tyler Mann, Mike Rowe and Larsen Keys could play key roles. Defensively, the Warriors have some experience back with Ethan Edney, Cam Mullins, Ryan Coulter and Colby Koch. The Warriors are expecting to use a mix of youth and experience to take a run at the division title. Head coach Steve Sheridan is hoping there is some truth to the saying ‘defense wins championships.’ The Hornets were in a tough spot last year when they only had one starter back but with six back this season, Mansfield will have a lot more experience heading into 2015. Eames will patrol the middle of the pitch with the Hornets alongside junior James Chotkowski. Jared Miller will get an opportunity up top to try and provide a scoring punch while Sheridan expects big things from Michael Kirejczyk in goal. However, the Hornets biggest strength will be the defense. Elsner is back in the middle alongside junior Max Gurnon. Sophomore Nick Hyland is back on the outside with some experience under his belt while the other spot is still being highly contested. Similar to Mansfield, the Rocketeers will be relying on their defense this season. With both center backs returning and with last year’s goalie back again, North Attleboro will be looking to make it tough for opponents to score. Matt Coscarella and Gareth King are back in the middle of the defense while Rob Heaney will be back in net. The key going forward for the Rocketeers will be fitting new faces into the offense. Gabe Pinhancos will take on a big role in the center of the midfield while junior Leo Charlebois and senior Yezan Ismail will be relied on up top to find the back of the net. The Tigers will be looking to get back to the playoffs after missing out this past season. With a good combination of experienced players and new talent, head coach Dave Purpura is hopeful for a bounce back 2015 campaign. The combination of youth and experienced players could be a good formula with the division race wide open. Seniors Derek Pereira, Austin Botelho and Torin Mizuno are all back with a lot of varsity experience while younger players like sophomores Riccardo Da Fonseca, Daeshawn Duffy, Liam Crowley and freshman Hasan Farahat all could play vital roles this season. Along with Mizuno and Da Fonseca in the back, seniors Luke Figueira and Matt Holt will be prominent figures. Sophomore goalie Marc DeSousa is back after earned the starting role midway through his rookie campaign.